Not to much new going on, but I figured I’d drop as much of a load on you as I could. So this is a follow up to the American Brown Ale I brewed over Fourth of July weekend. I finally got a chance to transfer tonight. This was originally a 10 gallon batch, for the transfer I left 5 gallons traditional and 5 gallons I added chocolate to it. This is the third time IÂ have used chocolate. 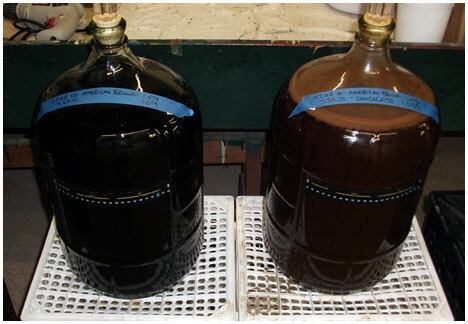 The first was way back in March of 2000 when I brewed a Chocolate Stout with Hershey’s syrup, didn’t turn out so hot. Second was June of 2008 with the Chocolate Porter where I used Cacao Nibs (raw chocolate), turned out great but I actually desired more of a chocolate punch. And this time July of 2010 with the American Brown Chocolate using powdered cocoa from Ghirardelli’s. Hopefully I just didn’t brew five gallons of a hot mess of a drain pour, but we’ll see, that’s what it’s all about sometimes. Other than that I’ve got three beers on tap for the first time in a long time, the American Wheat (good but with a lot of diacetyl), the Grilled Pineapple Wheat (good but with less specialty characteristics than desired), and the California Red (yummy!). I’ll try to put a proper review of those three beers up soon, it’s been a while. This entry was posted on Wednesday, July 21st, 2010 at 9:21 pm	and is filed under Homebrew. You can follow any responses to this entry through the RSS 2.0 feed. You can leave a response, or trackback from your own site.